This card strikes me as odd today – except, perhaps, in relation to my dreams. Actually, though, on first instinct, I “heard” her tell me to choose the location of my shop wisely because the environment I set up in will have much of an impact on how the energy flows in the building itself. While I was typing the messages for the King of Pentacles, I started daydreaming about the decor of the shop – of having murals painted on the walls and celings. I was seeing the Zodiac on the ceiling. Somehow, that daydream, the location and decor of my physical business, seems connected to this card. I’m not sure how or why, I’m just stating my gut reaction to it. I generally guide people to pay attention to their surroundings when this card surfaces – to be attuned to the messages of animals, to be aware of their treatment of the environment, or to notice things in their environment that have changed or might feel unsettling. The last time I drew this card was when I was looking into buying a house, and I haven’t drawn her since. When I was looking into buying the house, I paid close attention to environmental issues. The house I was looking at actually had a gas line running between it and the house next door – with huge pipes and valves protruding from the ground. It was an eye-sore that someone had attempted to shield with strategically placed fences and vining plants. The house I was also looking at was located near a dog food plant, so there was the constant “aroma” of dog food in preparation. Those two factors alone probably would have made me very unhappy (if not unhealthy!) in the long run, so it doesn’t surprise me that the house I was choosing did NOT become my house. 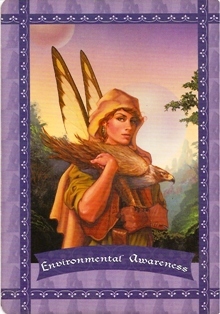 Card Meaning: The Fairy kingdom is very concerned with the health of Mother Earth. By drawing this card, the fairies are recruiting you to become involved in environmental matters. Definition: You have the power to make a huge impact on our planet. Earth is a living, breathing being, and the fairies are calling upon you to help her. Your contributions could include recycling, picking up trash while on your nature walk, switching to environmentally friendly cleaning products, becoming a vegetarian, or educating your children about the fragility of nature. When you spend time outdors, mentally ask the fairies for guidance on how to make your special contributions to Mother Earth’s well-being. The fairies will give you answers in the form of thoughts or feelings, by arranging a synchronistic opportunity, or by helping you use your unique talents to help educate others about environmental concerns. Affirmation: It feels good to nurture my planet with loving care. Source: Healing with the Fairies Oracle Cards by Doren Virtue, Ph. D.
Afterthought: Naturally, I was thinking T when I was daydreaming about the murals on the wall. That’s what he does. As a general contractor, he does lots of things – but his gift with visual art is absolutely amazing and raises goosebumps on my arms. I’ve seen his work – he’s incredible, and if I were to choose someone to bring to life the visions in my head in the form of visual art in my shop, he’d be the one I choose, without question. The other night, I did a reading for a new client, one who has since become a weekly standing appointment, and with whom I’ll be working closely long term. One of his greatest gifts is interior design, and it was discovered in his reading that his greatest attribute might be in “going green”. Incorporating environmental awareness into his designs, and his forte is bringing the elements of the outdoors in. I noticed when visiting his house that each room was an expression of nature. His living room was safari, with fabrics, textures, and prints that reflected the animal kingdom. His kitchen, however, was designed in florals. Each room had a different theme, but each theme was tied together by the common thread of nature. This is a concept I’d love to have applied to Enchanted Elements. I don’t want it to be a store or an office, I want it to be an experience – and if I could apply T’s gift with visual arts and E’s gift of environmentally friendly interior design with the elements, I’d have the perfect environment for doing my work. No really. HA! HA! Hee! Hee! What was my first line in the Tarot post? That I had to laugh at the truth of the situation. What did I write about last night as what helped me through my own misery? T bringing me to hysterical laughter… a giggle fit that felt wonderful. Indeed. Laugh it off, girl. Laugh it off. Someone I once thought I knew used to say, “If this situation wasn’t so tragic, it’d be funny!” – And that’s the reality of these two cards being drawn together. It’s the epitomy of that phrase! Ha! Ha! Ha! This is the first fairy I ever “saw”. I’d had this deck for a short while and was living in Tulsa, Oklahoma. That’s where I really had the opportunity to get to know myself in new ways. I’d built what I called a Moon Circle in the back yard. It was a meditation spot I’d created using cut firewood that had been left there by the previous tenant, stones, and a tree stump in the center for sitting. I’d empowered the circle with my own concoction of salt, oils, potpourri, etc. and lined the circle with it. Well, one morning I’d gone out at sunrise to meditate and had taken my Fairy Oracle Cards with me. I sat on the tree-stump in the center of the circle, eyes closed, taking in slow, deep breaths. My concentration was broken by the sound of a giggle. I thought a little kid had been peeking through the fence or something, so I opened my eyes and took a good look around, but as soon as I’d opened my eyes, the giggling stopped and all was quiet. There was no one at all in the area – and being that it was dawn, wasn’t likely there’d be children playing nearby. I closed my eyes again. Again, I heard the giggle, followed by a “shh… you’ll draw attention!” Then, the giggle was muffled. This time, though, along with the sound of the giggle, I had a “vision”. I saw this fairy card… animated. The red-headed fairy was standing on a tree limb just to the left of where I was sitting. She was looking right at me, giggling, with a sparkle in her eye. 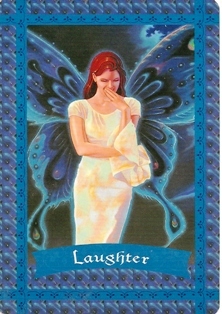 Next to her was an older, rounder, “grandmotherly” fairy (one not in my deck) who was trying to “hush” Laughter. They looked like cartoons. In all the books I’ve read and studies I’ve done, it’s been made clear that to “see” a fairy is not done with the human eye as much as it is with the psychic eye, the third eye, or in “astral” form. I do believe that this encounter was my first TRUE experience with actually seeing a fairy, and she shows herself to me often. I’ve seen her again since that time, and so whenever I draw this card, I let out a little giggle – and it feels as though I’m seeing an old friend. Her message is to enjoy the humor in life, and to laugh often. Laughter is said to be the best medicine. You can’t feel angry if you’re laughing. You can’t feel depressed if you’re laughing. Laughter heals… lighten up and give a giggle! Card Meaning: Every cloud not only has a silver lining, but it also has a humorous side. Try to objectively stand back from your situations and find a humorous twist. Laughter will help you see your life from a new perspective so that you can receive creative insights and solutions. Description: You are much too serious about life, according to the fairies. They aren’t asking you to neglect your responsibilities, let go of the sacred reverence for life, or defend your emotions with jokes. Instead, you’re asked to see the humor that runs through the thread of life. Like a brilliant comedy, our lives become more enjoyable when we can see them through the eyes of a humorist. Laughter helps us to stand back and see ourselves and our situations more objectively. When we laugh, we relax. And when we relax, creative solutions and renewed energy course through us more easily. So, take time today to laugh. For instance, go see that new funny movie or play, buy a book by your favorite comedy writer, or exchange silly jokes with a friend. Affirmation: I find the humor in life, and I laugh easily. This made me smile… wide. Isn’t she just radiantly beautiful? I love this card. She gives me warm fuzzies and chilly willies all at once. I’d mentioned recently that over the weekend, T helped me with a reading. Since my return home, I’ve drawn some of the cards that surfaced in that reading, including the Seven of Swords and the Beauty Fairy Oracle. Today’s fairy was also a part of that reading, and it encourages me to believe in and USE my own inner power to generate the desired changes and provide what I need. This is a card that makes me cry healing tears. I needed this card today. Not only is it perfectly synchronized with the Ace of Pentacles drawn this morning, but it also corresponds with my recent thoughts and ideas in regard to my goals, dreams and aspirations – providing what I can through tarot readings, preparing to move to a new house (which is still pending! ), and considering the possibility of opening my own magick shoppe, not to mention the books I’d like to write. Definition: You have within you all of the power of the Universe. No one is more powerful than you. As a spiritually minded being, it’s impossible for you to misuse or abuse your power. Your guides will bring you opportunities to use and expand your power in ways that bring great blessings to you and the world. Heaven needs the lightworkers of the world, including you, to realize and utilize their power. By drwing this card, you’re being asked to release any fears you may have about being powerful. You’re asked to keep your self-esteem high by honoring yourself, taking excellent care of your physical and emotional self, working on your dreams and aspirations, and spending time in prayer and meditation. The higher your level of self esteem, the more comfortable you will be with your power. Affirmation: It is safe for me to be powerful! I have all the power of the Universe flowing through me and supporting me. Due to technical difficulties and time constraints, I’m going to group it all in one post – and omit images. I don’t like doing it that way, but it’s better than not doing it at all. Today’s cards that I’ve drawn are repeat cards, meaning I’m stuck in a cycle I’ve yet to break. Not surprising, really, and they’re right on target with how I’ve been feeling. Things coming back to haunt you; revisiting and taking responsibility for one’s actions (past or present); spiritual awakening; forgiveness; facing consequences; learning from experience; reaping what you have sown. Speaking of fairies, today’s draw is also a repeat card, drawn six days ago on July 10th. 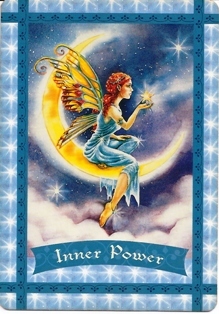 Card Meaning: You are receiving guidance from your true self, your higher consciousness, which is one with Divine universal wisdom. You are listening to love rather than fear. Description: This card is a validation that your recent feelings, thoughts, dreams, and aspirations are coming from Spirit. You have been asking for Divine guidance, and your higher self has answered your prayers. Your spiritual path has helped you hear this voice because you’ve taken the time to listen. Perhaps you’ve begun a meditation or yoga practice, and this has helped you quiet your mind. Or maybe you’ve put your foot down to the Universe and have adamantly decided to improve your life. Whichever route you’ve taken is working very well. Now, the fairies ask you to keep having conversations with your higher consciousness. This will involve carving out time away from noise and stress. You may need to take frequent nature walks, join a spiritual support group, or go on a retreat. By quieting your life and your mind, the voice of your higher consciousness becomes increasingly loud and clear. It guides you perfectly through all life areas. Affirmation: I easily hear and understand the inner voice of Spirit. Waxing Moon: New Moon to Full Moon (this Friday is full moon!) is the ideal time to do magic to draw things to you. Moon in Capricorn: Develops strong structure. Focus on traditions, responsibilities, and obligations. A good time to set boundaries and rules. Due to those pesty internet issues, I’m skipping today’s horoscope. Well, she’s no stranger to me. In fact, I drew her exactly one week ago, on July 6th. The fact that I’m drawing her again today means that I have not yet resolved the issue. The problem is, I don’t see how I can resolve the issue with my schedule looking like it does. Six days in a row I’m working, and Rhythm’s bringing a friend home with him today, so I’m not anticipating much quiet time over the next week. T had talked about going to see his sister again next weekend, but even if I can get the time off work to get away, there’s not much “quiet time” in those trips. Don’t get me wrong, I LOVE those quick getaways – and he’s got an incredible family that I enjoy spending time with… it’s just not that meditative quiet time this card encourages. But, the Financial Flow card from earlier surprised me in how it manifested, with an increase in the monthly income – so this card may also hold her own surprises. 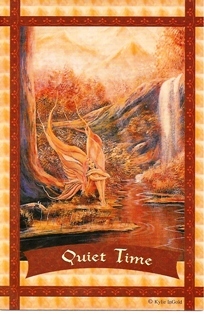 Card Meaning: You need some time alone, away from other people and environmental noises. Even a brief respite would be extremely rejuvinating for you. Description: Sometimes we’re not even cognizant of the detrimental impact of stress in our life. We become so accustomed to living in an uproar that we’re not aware when our body is telling us that it’s on overload. The symptoms include illness, unusual fatigue, depression or anxiety, appetite and weight issues, addictions, sleep disorders, irritability, and a desire to withdraw from life. By drawing this card, you are being asked to honor your body and soul by spending some quiet time alone — as soon as possible. This might mean going on a silent retreat; spending a day at a lake, beach, or in the mountains; taking a hike; or visiting a day spa. You could even turn off your phone, put a ‘do not disturb’ sign on your door, and take an afternoon nap, a long bubble bath, or read your favorite book. Regardless of the form that your quiet time takes, the fairies just ask that you keep this promise to yourself without delay. Affirmation: I now give myself permission to be silent within and without. My mind is quiet, and I enjoy my own company. Well, this fits for today, I’d say. Much of what’s been on my mind lately has had to do with parenting and children on multiple levels. Obviously, I’m excited over Rhythm coming home and have had a hard time with him being away. I’m equally as concerned about Stinkerbelle leaving today and being gone for three weeks. My writings lately have reflected Atlas and how I’m still dealing with the emotional consequences of how he and I parted ways six years ago, and the fact that it’s been a year since I saw him last. On the flip side, I’ve been thinking about my own parents… my genetic make up, and how I feel when I’m exposed to my own parents for too long. 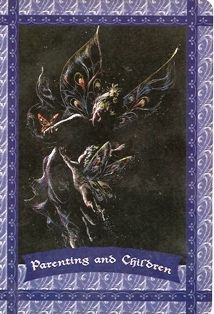 Card Meaning: A positive change is occurring for you in the area of parenting. An unexpected occurrence will herald a happy outcome between you and a parent, a child, or both. Description: Family units are extremely important to the fairy realm. They understand the value of taking care of these relationships. The fairies never allow hurt feelings to fester. They promptly discuss misunderstandings, and they share their feelings honestly with one another. By drawing this card, you are urged to face up to any ill feelings you may have with family members, and take human and spiritual steps to effect a healing. This card may also signal that a new family member is coming into your life. This could mean a new child or a new family member by marriage. It could also signify the return of a family member with whom you’ve lost contact. These changes come to you on heaven’s wings, meaning that you are safe, protected, and will derive enjoyment from them. Affirmation: I have happy parent and child relationships. I allow my heart to open up so that I can feel compassion and love for all members of my family. I think this one falls right in line with getting my own room and having a “sacred space” of my own.